Since the young women that we serve are always maturing (new Beehives come in from Primary, Laurels graduate, etc) we are bound to have new situations come up that we haven’t dealt with before – even if we’re seasoned YW leaders. For example, we have a YW in our ward who has some special needs, but is very enthusiastic about Personal Progress. She has recently become frusterated in her recent attempts to “pass off” Value Experiences that she simply didn’t understand. This was a new situation for me. As a presidency, we decided that we needed to work with her closely to achieve these goals, but also adapt the program to her ability level. But how would we do that? But how exactly were we going to do that? I am on the Personal Progress site (a section of lds.org found HERE) regularly, but until recently I hadn’t noticed that under the “Get Started” section of the site, on the left side of the page, there is a category labeled, “Personal Progress for Those with Special Needs” (if you click on the title in red here, the pdf version will open for you). 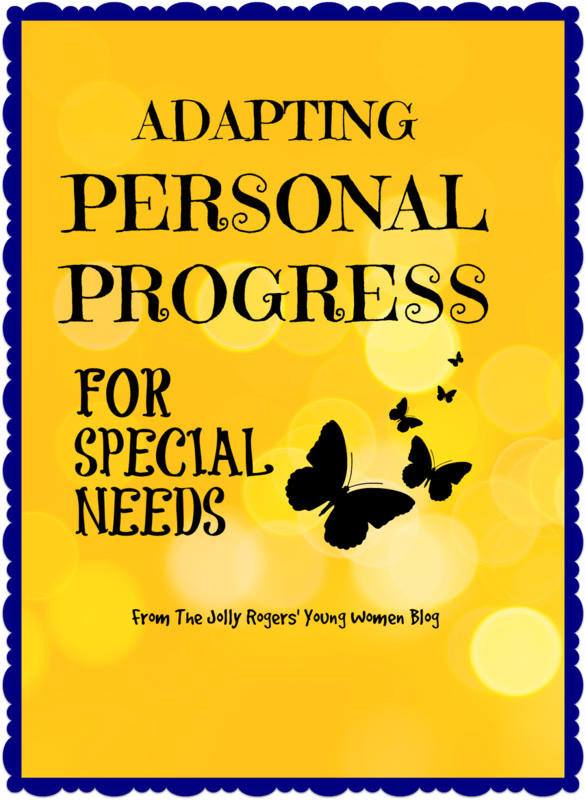 This is a printable version of Personal Progress that has been generally adapted for general special needs. The same type and number of Value Experiences and Value Projects are still required, but the Value Experiences and the suggested Value Projects have been somewhat simplified. Our particular situation required a much greater level of simplification, so I’d like to share with you what we have done. Again, what we have done may or may not be appropriate for a special-needs girl who you are working with. The young woman that I am working with has severe limitations. What I have done certainly would not be appropriate for most girls. You may be surprised at how much we have simplified the program, but it was the result of much thought and consultation about one specific girl’s particular abilities and maturity level. As a Presidency, we have agree that this is an appropriate level to challenge this particular girl, yet still making passing off Value Experiences and Value Projects attainable for her. I purchased two 3-ring binders. They are identical, except that one was pink (for her) and one was blue. PINK NOTEBOOK: This is the notebook that this YW will take home with her to work on. I made a cover page that I inserted in the front with the YW’s name and “Personal Progress” in large letters. I also used a sharpie marker to write her name and “Personal Progress” on the outside edge of the notebook (to help the family identify the notebook in case the cover page was removed and/or lost). On the inner cover, I also wrote the following (in sharpie marker) “when you have finished your assignment*, bring all your papers and this notebook back to one of the yw leaders during church or mutual”. This YW has received several Personal Progress books, but has lost them all. We hope that this notebook will be more difficult to misplace. We are asking her to bring the WHOLE notebook with her, so that a new “assignment” can be entered when the completed one is removed. BLUE NOTEBOOK: This is the notebook that we will keep in the YW closet at church. I wrote her name and “Personal Progress” on this notebook as well, but I also added the words “YW Leaders Notebook” and “Please leave in the YW closet”. We will keep her tracking sheet, completed “assignments”, and a few future “assignments” in this notebook. The main purpose of this 2nd notebook is partly to prevent the loss of all of her work if her pink notebook is misplaced or lost, but also so that any YW leader can sign-off her work and give her the next “assignment” when she is ready. *We’re referring to the Value Experiences as “assignments” in this case because of the confusion the new lingo was causing her. “ASSIGNMENTS”/VALUE EXPERIENCES: Using the Personal Progress for those with Special Needs” as a guide, I typed up ONE Value Experience at a time, each one on its own page. We felt that having multiple options listed on the same page was part of the confusion for her. For each page I made, I made sure that the Value Category and the # of the Value Experience are clearly shown at the top, to make it easier for us as leaders to identify/mark off the completed Value Experience when she completes an “assignment”. We will give her these 1-Value Experience “assignments” to her one at a time. Read the scripture Alma 56:45-48 (in the Book of Mormon). Ask an adult woman (who is a relative or a Young Womens leader) to tell you about a time in their life when they learned about faith. You may notice that I did not include online resources such as videos and online games that were suggested, this is simply because this particular girl doesn’t have internet access. Otherwise, they would be great to use! Of course, we will be providing support and help as needed, but I tried to simplify it to the point that she should be able to complete the assignments with little or no help. Ideally, parents would be able to provide assistance with Personal Progress, but that isn’t always possible in every scenario. Another idea that people have suggested is assigning a YW mentor (another YW who has completed Personal Progress) to work with her. That is a fantastic idea! However, in this particular situation, we have a sister who is called as a YW Leader specifically to work with her, so we feel like having this YW leader and the Beehive leader work with her is the best fit. As with everything else, this will depend on her needs and abilities. I hope that this gives you a starting place to consider adapting the Personal Progress program for girls in your care who are differently abled.